Mr. Castle states that the counting for the polka is 1-2-3-hop, or (for the gentleman) Left-right-left-hop, with the hop coming on the left foot. He encourages the dancer to not exaggerate the hop. I am aware that the Castles ran a similar, perhaps identical, article in the October, 1914 issue of The Ladies Home Journal. I hope to one day get my hands on it to make a comparison. Susan DeGuardiola appears to have seen the original article, and discusses it here. Mr. Astaire’s choreography greatly exceeds the four relatively simple figures provided by Mr. Castle in his Washington Times article. This does not mean, however, that Mr. Astaire’s choreography was inauthentic. 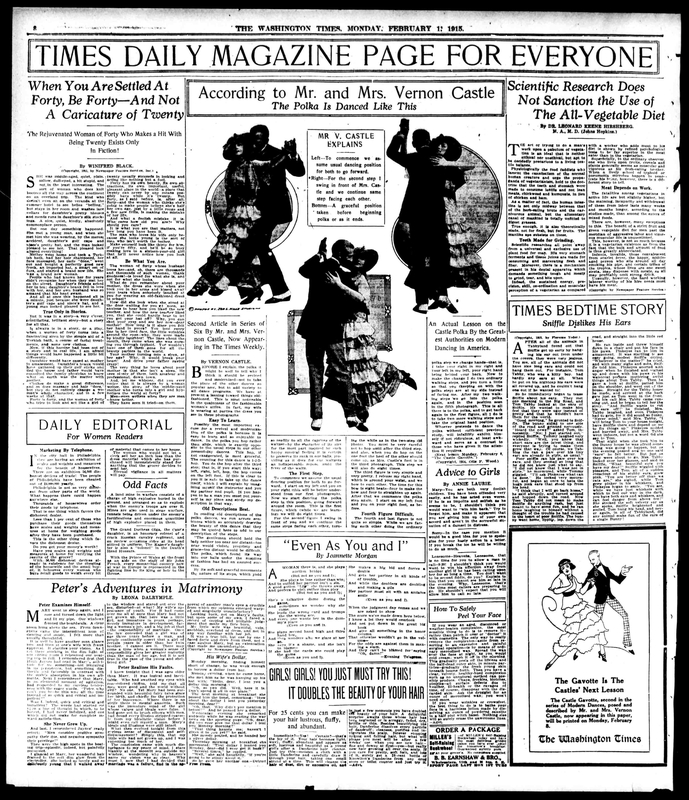 While I currently have no means to validate the steps used by Mr. Astaire in this particular clip, it is worth noting that Mrs. Irene Castle was a consultant on the film, and that many of the other ragtime dances reproduced by Mr. Astaire in The Story of Vernon and Irene Castle were historically accurate. Mr. Astaire was reportedly a fan of Mr. Castle’s, having admired Vernon and Irene’s dancing at the height of their popularity, while Mr. Astaire and his sister were performing the vaudeville circuit. The article was provided by Chronicling America. The featured image was downloaded from the New York Public Library Digital Collections. An interesting aside: as evidence that way really does lead on to way on the internet, a very little bit of research informs me that Ms. Sharon Davis, cited above as presumed creator of the youtube Castle montage, appears to be a London based dancer specializing in jazz age dances. You can check out her website here.